We were contacted by a New Jersey custom home builder that was building an exceptional home on the New Jersey Shore. The interior designer showed a modern stair design. 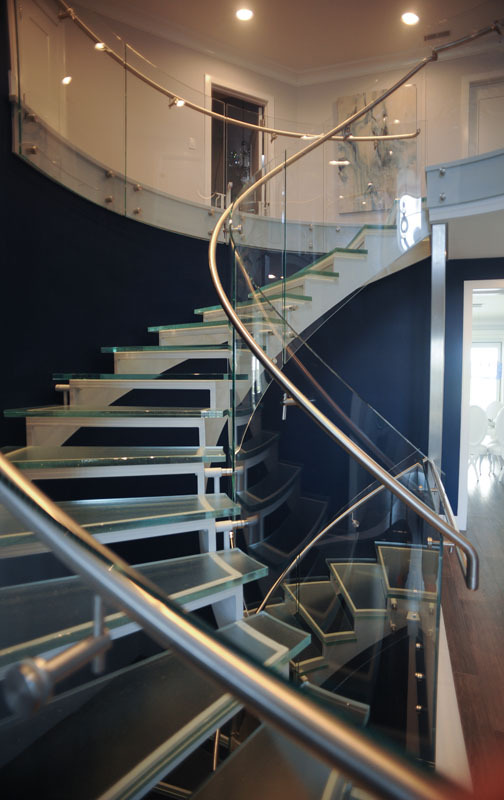 Radial steel stair stringers on either side of glass treads, curved glass railing and brushed stainless handrail for both flights of these custom curved stairs was their desire. The first challenge was engineering the curved steel stair stringers because the design intent was for open tread design. Next challenge was calculating the correct rise and run of each tread, in conjunction with the correct stringer radius and rake angle for both the inside and outside to match perfectly for level glass stair treads. All the glass treads were specifically designed and had a special texture and edge treatment for an awesome wow factor. 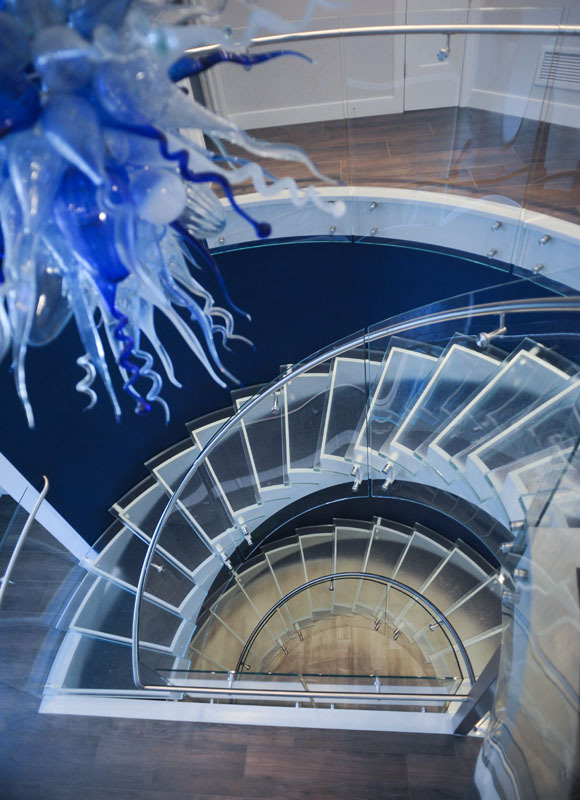 The glass railing had to be carefully engineered and designed for correct curve and incline along with all precise mounting points as the glass railing was suspend from the sides of this contemporary stair. 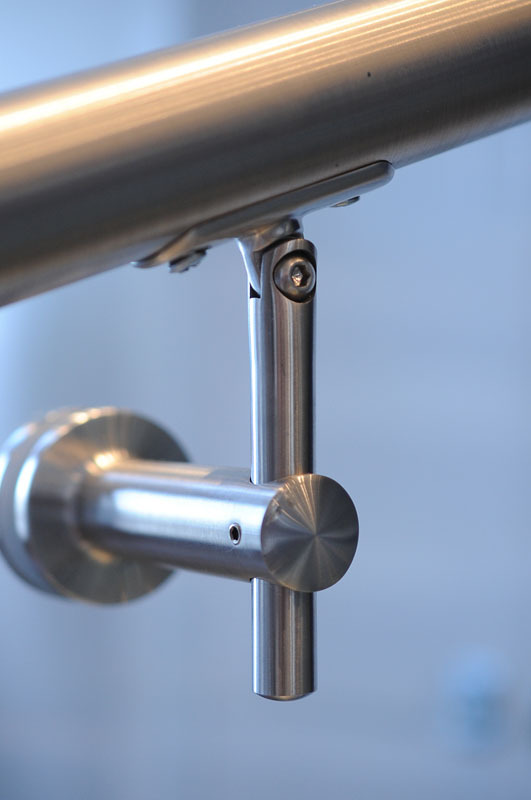 The steel stair stringers were custom created, the structural members were minimal in design for design continuity, but still to meet engineering requirements. Entire stairs were created and powder-coated. Then the next challenge was incurred of maneuvering these heavy, 1 ton plus, steel stair stringers through the front door opening. But with creative engineering, these modern stairs were taken through the opening, hoisted into place and anchored. 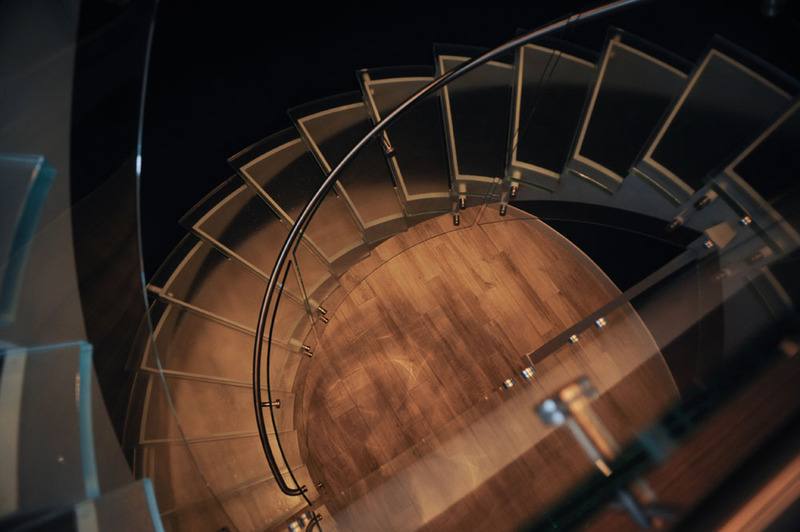 All the glass treads were affixed into place, the glass railing suspended unto the side of the glass stairs, the brushed stainless handrail installed. And a phenomenal glass stair was completed!! 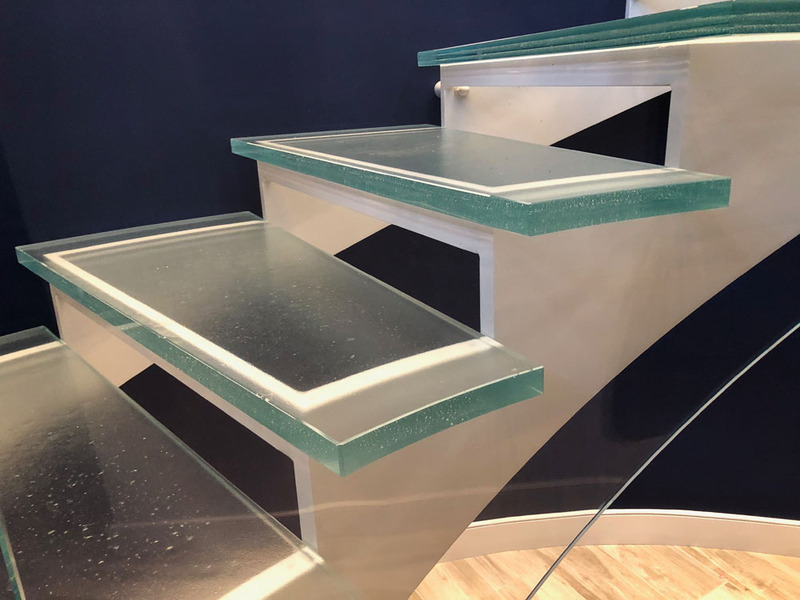 This custom glass stairs elevates the design caliber of the built space that it resided in, a testimony to the vision of the interior designer. A New Jersey shore home, complete with 2 sets of glass stairs, make a design statement to be appreciated for many, many years.